Peanuts are packed with all the essential nutrients good for health. Peanuts are rich in protein, carbohydrates, calcium, manganese, magnesium, phosphorus, zinc, potassium, Vitamin E, VitaminB3 (niacin), VitaminB5 (pantothenic acid), VitaminB9 (folate) and essential dietary fiber. Peanuts contain anti-oxidants. The process of roasting peanuts increases its anti oxidant content remarkably. Peanuts are also a rich source of fats. However, these fats are not the harmful fats. These are monounsaturated and polyunsaturated fats. These fats lower bad cholesterol levels and help in maintaining a healthy heart. The peanuts also contain essential fatty acids namely linolenic acid. These fatty acids collectively help in maintaining healthy skin and healthy hair, keeps the blood pressure in control and are vital for growth. Peanuts make healthy snacks. They are a popular food all over the world. Last month we enjoyed Candied Peanuts and also the Cherry Cake that had peanut flour. Peanut fudge( burfi) is a low calorie sweet that was made for diwali. 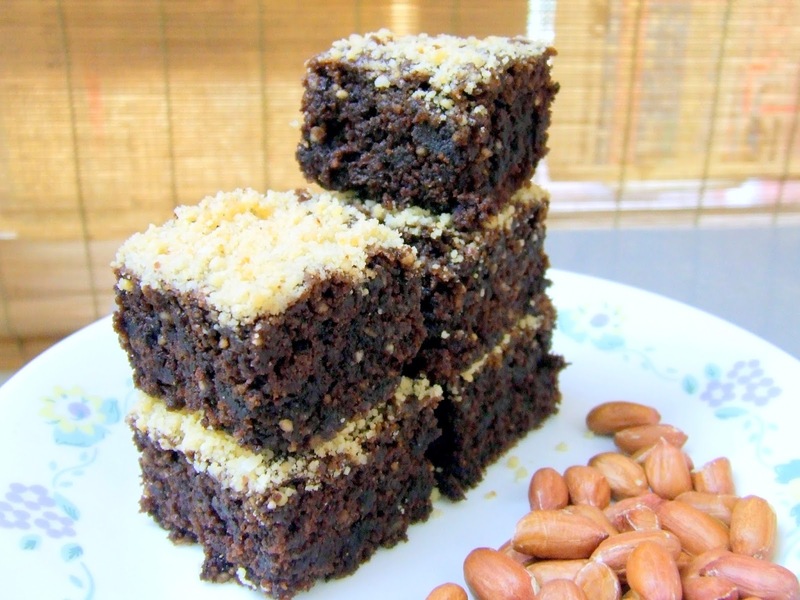 Here is the recipe of Peanut Brownies from Nita Mehta’s book. I make these brownies quiet often. Original recipe asks for all purpose flour, but I always make them with whole wheat flour thus making them healthy and filling. Pre heat the oven to 160 degrees C. Grease, line and dust an 8 inch square cake tin. Boil milk. Add vinegar. The milk will curdle. Keep it on fire for ½ minute. Remove from fire. Let the mixture cool down. Mash the cottage cheese. Do not separate whey and cheese. Let it cool completely. Add oil. Sift whole wheat flour with baking soda and cocoa powder. Add powdered sugar and ½ cup ground peanuts. Mix well. Transfer the flour mix to a wide mouthed deep bowl. Add liquid ingredients. Mix well. Add vanilla essence. Pour the batter into the cake tin. Sprinkle ¼ cup ground peanuts. Bake in a pre heated oven for 45 minutes. Remove from the oven. Remove from the cake tin after 10 minutes. 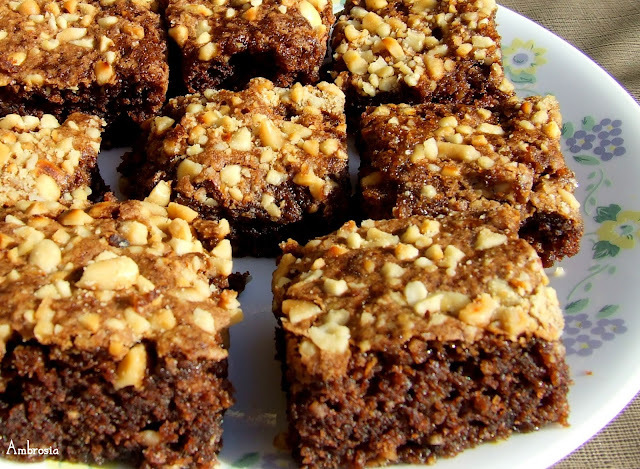 Oh Namita... before I get down to make one of your goodies, there is another tempting post up!! And this one sure is killing me... soooo tempting! I could use a couple of brownies immediately! *sigh* Very interesting recipe, another one bookmarked to try. Wonder when I will do justice to all your super healthy posts here!! Love the way you have used cottage cheese and whole wheat flour to make these awesome looking and super healthy brownies. Lovely technique. The brownies look super fudgy. Thank you again for linking. They look tempting! 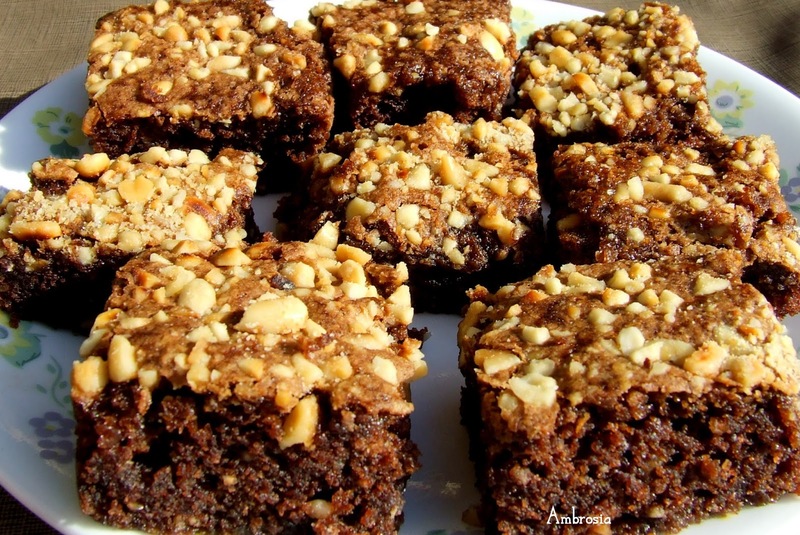 Chocolate and peanuts - what's not to love! Hello there , landed at your place by chance and I am glad I did ! Saw this recipe in the morning and decided to give it a go with minor change of using 1/4 cup of oil instead of the given quantity , this came out very nice . I ll be making it again . Taste is somewhat closer to atte ka halva and I am not complaining . Thanx for sharing .